12 Ready salted potato crisps, 6 salt and vinegar flavour potato crisps, 6 cheese and onion flavour potato crisps, 6 prawn cocktail flavour potato crisps, with sugar and sweetener. 12 READY SALTED 6 SALT & VINEGAR 6 CHEESE & ONION 6 PRAWN COCKTAIL BRITISH POTATOES / Thinly sliced for a golden, crispy crunch / Our family owned crisp specialists have been perfecting the nation’s favourite potato snack since 1956. Each season, they work closely with farmers to select the best variety of potatoes for the perfect crunch. Then they slice, fry, and tumble each crisp in classic seasonings for a full, balanced flavour. Prawn cocktail flavour potato crisps with sugar and sweetener. 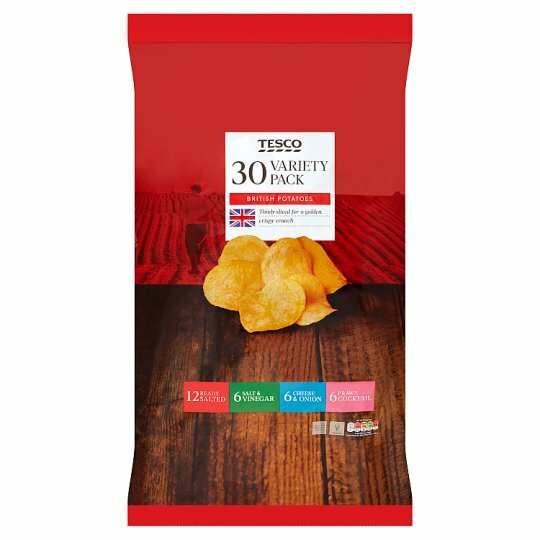 INGREDIENTS: Potato, Sunflower Oil, Cornflour, Flavourings, Salt, Dextrose, Sugar, Citric Acid, Yeast Extract, Onion Powder, Tomato Powder, Colour (Paprika Extract), Sweetener (Sucralose), Black Pepper Extract. Cheese and onion flavour potato crisps. INGREDIENTS: Potato, Sunflower Oil, Dried Onion, Salt, Whey Powder (Milk), Dextrose, Sugar, Flavouring (contains Milk), Yeast Extract, Dried Garlic, Mature Cheddar Cheese Powder (Milk), Cheese Powder (Milk), Colour (Paprika Extract). Salt and vinegar flavour potato crisps. INGREDIENTS: Potato, Sunflower Oil, Maltodextrin, Flavouring, Salt, Citric Acid, Rice Flour, Dextrose, Yeast Extract Powder.